There's no question the American education system is in great need of overhauling. As I travel the globe and watch students from different countries tackle subjects that we don't even introduce our students until later High School or early College; it's not hard to deduce, a long term generational problem. Somehow we need to re-energize the love of learning to our kids, and expel the myth that getting C's in school is cool. We need them to understand the value of Math, Science, and the Arts; not to regurgitate an answer on a test, but rather; to embrace the love of learning. So how? 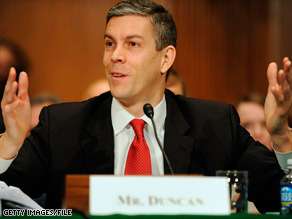 President Obama's Secretary of Education Arne Duncan proposed last week that students should go to school longer so they can get smarter. If Duncan gets his way, those long days of summer may erode away to just a few weeks, and the hope is, our kids will embrace learning. As the new administration sees the educational void in America in relation to the rest of the world they are trying to solve it with a day quantity solution rather than a day quality answer. I'm not sure they're hitting the nail on the head. Will a longer school year help America be any smarter? Next With Oil on the Slowdown, and an Economic Crisis??? I don’t think that this is going to help make students want to be in school and learn. If a student doesn’t want to learn making them stay in school longer will make them not want to be there even more. I think that we should have a school system more like those in other countries– the ones that go on to higher learning are the ones that want to learn, thus they learn more because they are not hindered by those that do not want to learn.